Today is the 328th anniversary of Ignazio Albertini’s death, making it a fitting time to take stock of this mysterious, troubled, yet clearly gifted Baroque composer who could have contributed so much to Western art had he only—not been murdered on Sept. 22, 1685. Albertini was an Italian violinist who moved to Vienna and became part of the inner circle of Johann Heinrich Schmelzer, then one of the violin greats of he Viennese court. 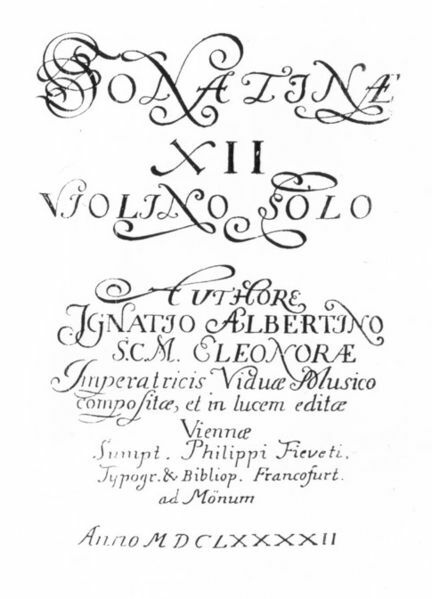 What’s intresting about Albertini is how clearly gifted he was as a composer, based on his one surviving piece of work, a set of 12 violin sonatas that channel the color, imagination, and technical sophistication of Schmelzer as well as another contemporary violin great, Heinrich Biber, and yet how apparently troubled he was. When he first appears in the written record, in an exchange of letters between Schmelzer and Karl II von Liechtenstein-Kastelkorn, Prince-Bishop of Olomouc, both Shmelzer and Karl II are admiring of his talent, but their written dialogue is in the context of some apparent misconduct he was accused of. It’s not clear what trouble Albertini was in, but it sounds like the good word of Schmelzer and Karl II helped put Albertini in a positive enough light that he later entered the service of Eleanor Gonzaga, widow of Ferdinand III, as chamber musician, and held that position until his death. And about that death: he was stabbed, the victim of a murder. So, what you get is a picture of a talented artist with a messy personal life, not unlike so many rock and jazz stars, many of whom have ended up on the receiving end of a weapon, like Harry Womack of the Valentinos, who was stabbed by his girlfriend. Or even like Bobby Fuller of the Bobby Fuller Four, probably best known for his hit “I fought the law and the law won,” who was shot in his car. His death is listed as a suicide but there’s enough messiness around the facts that it remains an open question whether someone else didn’t pull the trigger. In any case, artists lives are often messy, a price of being gifted sometimes, and Albertini would seem to fit that mold. His surviving 12 sonatas suggest there could have been some memorable music added to our cultural heritage had he kept his life pulled together a bit more. Ignazio Albertini (Albertino) was an Italian Baroque violinist and composer. He is known by a single collection of music, the twelve Sonatinae (sonatas for violin and basso continuo) posthumously published in Vienna and in Frankfurt in 1692. The collection was prepared for publication by Albertini himself, but he did not live to see it printed. His sonatas are multi-sectional pieces, very varied in content and structure, and all of the highest quality. Some idea of the rich variety of forms found in the Sonatinae may be gleaned from the following examples: Sonata IX is a passacaglia in which the main theme is presented as a canon at the fifth in the first and the last sections; and statements of the ostinato sometimes overlap with formal sections of the sonata. Sonata XII, the last in the cycle, consists entirely of imitative movements, unlike other sonatas, in which imitative movements are either absent or are surrounded by free sections, such as slow lyrical arias, toccata-like movements with rapid passagework over sustained bass notes, etc. Very little is known about his life, but he knew Johann Heinrich Schmelzer, one of the most important musicians at the Viennese court at the time, because Schmelzer in 1671 wrote a letter on Albertini’s behalf in praise of his musucianship. The letter was intended to help address some misconduct that Albertini was apparently accused of. Possibly as a result of some additional misconduct, Albertini died 14 years alter, in Vienna, the apparent victim of a stabbing. Read the On Baroque appreciation on the 328th anniversary of Albertini’s stabbing death.